On September 30, 1981, Dallas L. Peck was sworn in as the eleventh Director of the Geological Survey. He had spent his entire professional career with the Geological Survey, starting as a field assistant in 1951. Dallas L. Peck was a graduate of the California Institute of Technology, in 1951, and had received his doctorate from Harvard, in 1960. He had spent his entire professional career with the Geological Survey, starting as a field assistant in 1951. Peck had been a research geologist at the Hawaiian Volcano Observatory and had made extensive petrologic studies in the Sierra Nevada, but for 4 years before becoming Director he had been the Survey's Chief Geologist. The new administration came to Washington with a promise to increase private access to Federal lands for mineral and energy development, reduce the regulatory role of the Federal Government, accelerate and expand domestic energy and mineral production, and in general to reduce funding and staffing of Federal activities other than those related to national defense and a few other specified areas. For the Geological Survey, there were new responsibilities to replace or merge with ongoing responsibilities. In Alaska, the oil-and-gas assessment program in the National Petroleum Reserve was phased out, but the Alaska Mineral Resources Assessment Program was continued and expanded under the terms of the Alaska National Interest Lands Conservation Act of December 2, 1980. In January 1982, part of the Survey staff and operating budget were once again split off from the Survey as Secretary of the Interior James Watt announced the formation of the Minerals Management Service. The Conservation Division and part of the marine geology program, some 23 percent of the personnel and 29 percent of the operating budget of the Geological Survey, were reassigned to the new agency, and the Survey reverted to its initial responsibilities to classify the public lands, and examine the geologic structure, mineral resources, and products of the national domain as they had developed in the years since 1879. 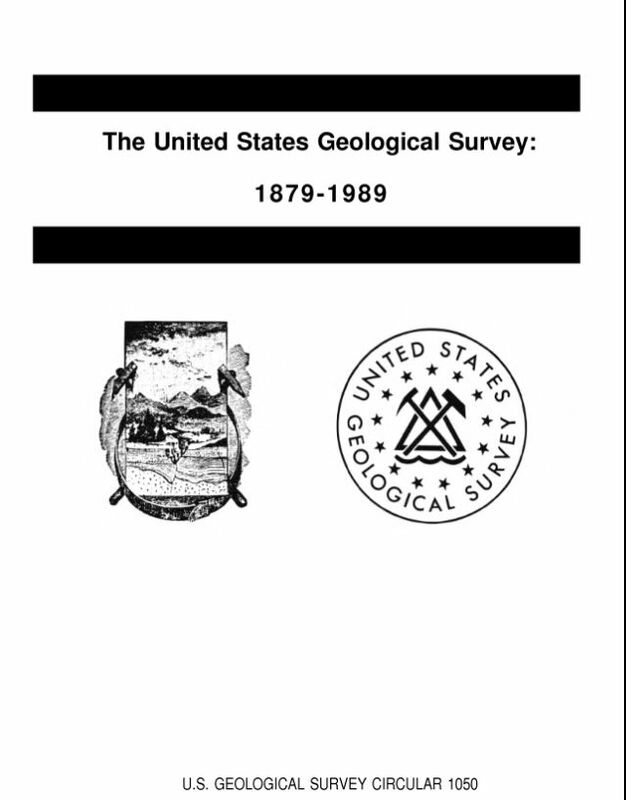 These were organized in three major programs: the evaluation of the Nation's geologic structure and the geologic processes that have shaped it, the assessment of its mineral and energy resources, and the identification and investigation of geologic hazards; the conduct of the National Mapping Program, involving the collection of cartographic, geographic, and remotely sensed data and production of maps and related cartographic information in graphic and digital form; and the provision of the hydrologic information and understanding needed by others to achieve the best use and management of the Nation's water resources. New challenges were not long in forthcoming. On March 10, 1983, President Ronald Reagan proclaimed an Exclusive Economic Zone (EEZ), which extended jurisdiction of the United States for a distance of 200 nautical miles seaward of the Nation's shorelines and thereby more than doubled the area of the national domain to be mapped and within which mineral and energy resources must be assessed. EEZ-SCAN, a reconnaissance survey that uses long-range side-scan sonar to map the 3 million square nautical miles in the zone, began in 1984. The initial atlas of computer-enhanced mosaics, covering the Western Conterminous U.S. portion of the EEZ at a scale of 1:500,000, was published with preliminary geological interpretations and bathymetry in 1986. Other studies provided geologic information on the nature, extent, and cause of coastal erosion for use by various Federal and State agencies in mitigating coastal retreat and land loss. The National Mapping Division continued the quiet revolution in mapping. The development and application of advanced cartographic techniques and systems to geographic information systems was continued, a National Digital Cartographic Data Base was established, and standards of digital cartographic data were developed for the U.S. mapping community. Primary map coverage for the United States was 97 percent complete in early 1989. In 1988, in cooperation with the Bureau of the Census, the Division completed a 1:100,000-scale digital data base of the transportation and hydrology features of the conterminous United States, which the Bureau of the Census will use to generate more than 500,000 different maps needed to take the 1990 census and which will also be used for many other applications. A major new program was begun in close cooperation with the Defense Mapping Agency to develop, install, and operate new mapping technology using automated computer methods, the goal being to have data for all maps in digitized form so that the maps can be updated easily and graphic products printed on demand. The National Mapping Division was also responsible for all functions that relate to domestic geographic names, and continued to compile, publish, and maintain the "National Gazetteer of the United States of America" and to manage the National Geographic Names Data Base. Early in 1984, the Water Resources Division published the first "National Water Summary," the product of the national water-use information program, describing hydrologic events and water conditions for the water year, providing a State-by-State overview of specific water-related issues, and identifying ground-water contamination and acid rain as two pressing water-resources issues. To improve the scientific understanding of acid rain, the Geological Survey began a study of the effects of acid deposition on lakes, streams, and aquifers as part of a program coordinated through the Interagency Task Force on Acid Precipitation. Also published in 1984 were the first six studies of major regional aquifer systems, begun in response to the intense droughts in the late 1970's, to assess the discharge-recharge dynamics, hydrogeologic and chemical controls governing response of aquifer systems to stress, and to develop computer simulation models. Congress authorized the Bureau of Reclamation to establish demonstration projects for ground-water recharge of aquifers in the High Plains States. The disposal and release of hazardous chemical and radioactive wastes and ground-water contamination problems were also under investigation to provide data to help alleviate their effects on the Nation's water resources, some of them to assist the Department of Energy in developing procedures and guidelines for identifying suitable waste disposal sites. Now several years into its second century, the Geological Survey continues to fulfill its original mission of classification of the public lands and examination of the geological structure, mineral resources, and products of the national domain. It continues to conduct research both on the cutting edge of science and with reference to economic and other issues of national concern, to develop and apply innovative means of solving problems in resource management. It looks forward to a continuing challenge to advance the earth sciences in the service of the public. Following his term as Director, he returned to the Geologic Division of Geological Survey in 1993 to conduct research on the granites of Yosemite National Park and the Sierra Nevada mountain range. He also served as adviser in the Office of the Chief Geologist. In 1995 he retired, but continued his research as an emeritus scientist until his death in 2005.